In a half shell, here’s everything you need to know about buying, ordering, and eating oysters in Paris. Oysters are in season (i.e. available and excellent) during any month that has an R in it (September-April), but you’re not likely to see the best on menus until October. Oysters naturally spawn in April and will spend the summer fattening up their plump little selves, plus you’re less likely to have bacterial issues with oysters in the chilly winter months. They feature prominently in celebrations for Christmas and New Year’s – roughly half of all oysters eaten in France will be slurped up between these two holidays. huître- an oyster. pronounced wee-tra (without the h). plats- European oysters with flat shells. They are rare (only 2% of oysters) due to overfishing and blights so be prepared to shell out the big bucks for these guys. creuses- Pacific oysters with cupped shells (the most common). Sometimes still referred to as Japonaise. claires– essentially these are oyster vineyards. They’re salt water basins that oysters spend time in that lend a particular terroir to each bivalve. They are used to cleanse and purify the oyster, and protect the delicate mollusks from extreme temperature changes. Time spent in the claires will change their flavor and texture and can even extend the shelf-life. Oysters are ranked according to size. When purchasing, you’ll see a number on the sign ranging from 00-5 for cupped oysters and 00-6 for flat ones. The smaller the number, the larger the oyster, so 00’s are the heavyweights while 6’s will be tiny. fines- small-medium sized oysters (it’s been calibrated). spéciales- slightly larger and fleshier oysters than the fines (also, calibrated). fines de Claires- fines oysters that have spent two months in the Marennes-Oléron claires filtering the the estuary water in and out of their fatty bodies. They are a higher density oyster that grow 20 per square meter. Spéciales de Claires- oysters that ripen for two months in the Marennes-Oléron claires but with more space so that they plump up more than fines de Claires. Pousse en Claires- considered a low density oyster (only 5 can be grown per sq meter), these oyster heavyweights that are grown in the above mentioned claires for four months. They’ll be very sweet and fleshy. Papillons- very small oysters (usually 30 grams). As with wine, the flavor and texture of an oyster are deeply dependent on where the oyster has been harvested. Each body of water has different trace minerals, tidal patterns, temperatures, and salinity that will change the flavor of oysters as it filters through their fattening bodies. The flavors will change from season to season and year to year in any given location depending on rainfall, algae and other natural factors. Aquitaine: Arcachon is a celebrated Southwestern bay near Bordeaux where oysters start off in the wild. Small babies then suction themselves to terracotta tiles that farmers deliberately place in the water. They are then placed in sacks (beds) and left to slowly grow and fatten up in the deep sea. They can occasionally acquire a greenish tint due to the algae. 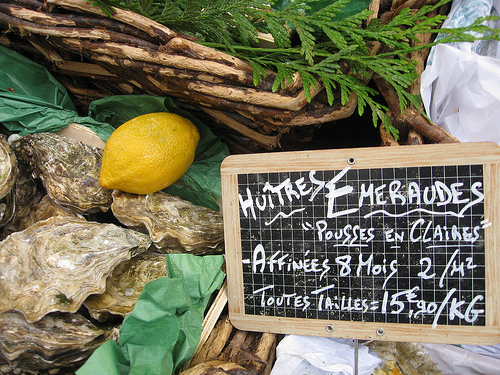 Normandy: The Northwest has deep sea oysters from Cotenin Peninsula, Isigny oysters, and nutty Saint-Vaast. Utah Beach is another well-known spot for sweet oysters. Brittany: The small amount of flat oysters produced tend to be farmed along Brittany’s coast. Cancale (firm and salty), Paimpol (juicy and plump from deep-sea farms), Bélon (oyster celebrities from the famed estuary in Southern Brittany that mature in brackish water), Quiberon (well-balanced flavor), Saint-Brieuc, Morlaix and the Bay of Brest are the regions most famous places for great mollusks. The Central West Coat: Ile de Ré, Noirmoutier, Baie de Bourgneuf, Pornic, and Beauvoir-sur-Mer are all areas for fine oysters. Languedoc: Bouzigue is noted for the extremely pure lagoon water (grade A) so that its oysters can be consumed immediately after being caught. Marennes-Oléron: You’ll find oysters from the Ile d’Oléron which are farmed, and Charente oysters that are fattened up in claires. It’s the claire-ripened oysters that are particularly noted from this region. Sometimes the bluey-green algae from the brackish waters will tint the oysters a special hue. 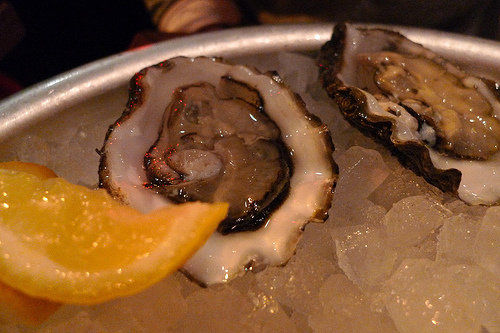 Oysters are almost never rinsed (to preserve the flavor), often shucked in front of you, and always served over ice. In France, they will typically still have the adductor muscle attached (i.e. they will stick to the shell) as that is thought to keep them fresher longer. You’ll want to take a tiny fork and gently pry it loose, if necessary. Squeeze a little lemon on top, pour some mignonette sauce in the shell, or forgo all condiments and slurp it back in one gulp. We first asked our panel of Contributing Editors three years ago to name Five Great Oyster Places for indulging in some half-shell love. Their overall favorite: Huîtrerie Régis. Huîtrerie Régis– Régis’ superb oysters come from the famous claires of the the Marenne-Oléron. They’re available for take out or to eat on the spot in the cheerful little dining room. L’Ecailler du Bistrot– The “bistrot” in question is carnivore-heaven Paul Bert, just next door. But at L’Ecailler the focus is on seafood, including a gorgeous array of Belon, Utah Beach, and Spéciales. Garnier– Get your Gillardeaux to go like Lobrano does or take a seat in this classic brasserie for some of the city’s best bivalves. L’Ecume Saint-Honoré– This charming poissonnerie has several tables for dégustation on the spot. L’Huîtrier– Claires and Belons are on the menu at this sleek address in the 17th. Le Baron Rouge– The bar brings in an oysterman from Brittany who shucks to order on the street corner. Shop at the Aligre market then scrunch among the trashcans and use a car as your tabletop for a uniquely Parisian oyster experience. Le Mary Celeste– Good cocktails, nice wine, and wild oysters served with a wonderful slightly spicy Asian-influenced sauce. In season, the bar does oyster happy hour with oysters for 1€ each..
La Cabane à Huitres– Francis Dubourg grows his oysters in the Arcachon basin and brings them direct to Paris for tasting in this adorable room outfitted to feel like a seaside shack (cabane). Chew them – how else get the full taste? Very informative article! I tried my first oyster recently and loved it. What’s your opinion on chewing oysters/swallowing them whole? Thanks for this article. Great photos!